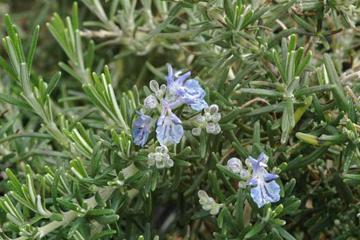 Low spreading, mat forming aromatic shrub with grey-green green leaves and deep blue flowers in May and June. Similar to 'Prostratus' but with darker blue flowers. Good ground cover for dry areas, banks or trailing over walls. Traditionally rosemary is used as a culinary herb, but also makes an attractive ornamental shrub for hot, dry positions such as a Mediterranean style garden.